I was going away overnight to a hotel located within a casino. I don’t do casino things (I was only staying there due to the location) I needed something to occupy myself and I hadn’t been sleeping properly so I wanted a really mindless knitting pattern. I think I searched Ravelry for like an hour or two trying to find the perfect pattern which had the combination of simpleness and yarn in my stash. 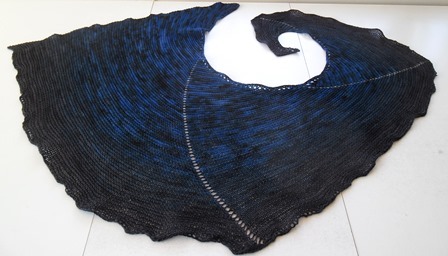 I finally found the Calypso shawl which I came across last year. I used a cake of yarn I won in a knit along last year held by Wool Gathering Australia. The challenge was trying new knitting or crochet skills. 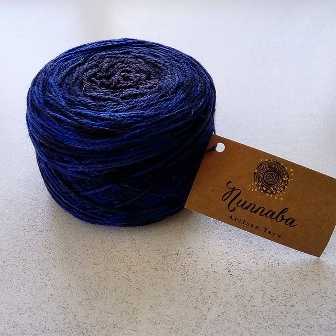 I was so excited to win this yarn as it is my colours blues and blacks. I wanted a one skein project and this was perfect for it. The yarn cake was so soft and squishy. It is a 4ply merino in the colour Midnight. This is a really easy pattern to follow and is super quick to do too, I finished this in about 2 weeks. 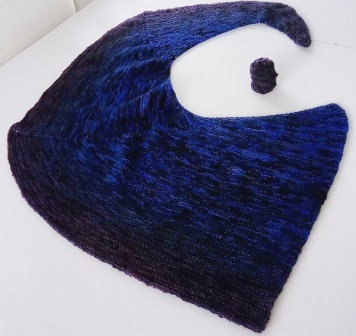 The pattern tells you how many sections to do to form the shawl and how to extend it you have extra yarn. I followed the pattern until I ran low of yarn which was in the extra section. To bind off I used the stretchy bind off that the pattern mentions. You are end up adding an extra yarn over as you bind off, it is much stretchy than other bind off methods I have used so I will be doing it again. The only difference to the pattern I did was something I read on Ravelry that another knitter had done. Instead of doing a yarn over at the start of my increase rows I did a K1FB in the first stitch. It gave me a much neater finish then the yarn over did. Before I blocking it looked kind of tiny. You can see from the photo how much yarn I had left after I bound off, I may have been able to sneak in an extra row but I didn’t want to fall short. I am not sure if there is such thing as over blocking but I blocked the life out of this. Blocking made it grow! 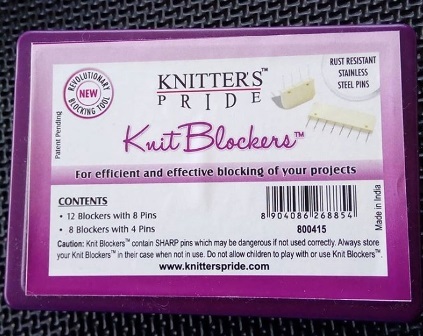 For the first time I used my knit blocker pins. They are basically a plastic clip that has a series of pins attached, they are much easier to use than regular pins. I used 2 full boxes on this shawl and the 4 blocking mats I had too. I am yet to wear this as I only finished blocking it last week. I have played around with it a little to see how it will sit around my neck. I brought the shawl pin at the craft show last month so I might use that on this. I am really liking this shawl, it was mindless fun knitting. After I finished it I was little lost and almost wanted to cast on another one.